Earlier this year, Jim Jarmusch's vampire film ONLY LOVERS LEFT ALIVE was released, and a very find film it was. 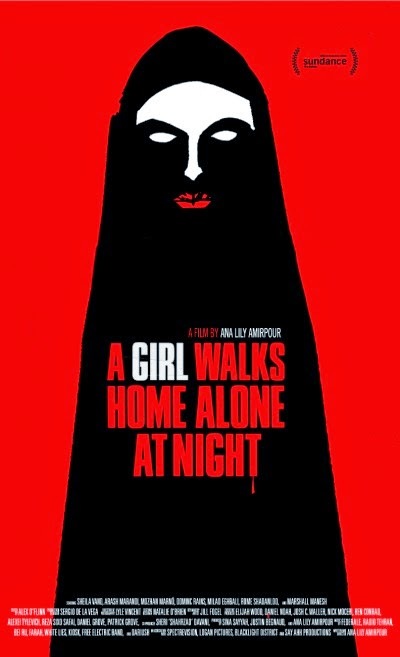 Had Jarmusch chosen to deal with the undead earlier in his career, and had he been an Iranian woman instead of a guy from Northeast Ohio, he might well have come up with something like A GIRL WALKS HOME ALONE instead. Of course that's a simplification; writer/director Ana Lily Amirpour has her own themes and stylistic touches, but the similarities to the early work of Jarmusch and other similarly inclined post-punk indie filmmakers who got their start in the early eighties are unmistakeable. The plot concerns Arash (Arash Marandi), a luckless young man who takes care of his father Hossein (Marshall Manesh). Hossein is in debt to local hood Saeed (Dominic Rains) due to his predilection for prostitues and heroin, and when he can't pay up Saeed takes Arash's prize possession, his car, instead. Meanwhile a lonesome vampire (Sheila Vand) walks the streets at night, occasionally feeding but mostly it seems looking for some sort of human contact. Eventually she finds it in Arash, and the two kindred spirits ponder the possibilities of leaving “Bad City” and all the bad things in it behind for the open road and the unknown. Despite one of the main characters being a vampire, it would be a mistake to call this a horror film. Generating fright is an afterthought at most here. Rather this is a movie about two outsiders finding each other and trying to find their place in the world, if such a place even exists. Along the way it also finds time to look at issues of gender and social inequality without stopping the movie dead in its tracks. The plot is kind of minimal and there's not a ton of action, but there's plenty of atmosphere and attitude and gorgeous black and white cinematography to go around, not to mention a killer soundtrack, and in this case that's more than enough. 4 out of 4 stars.